A magnificent and arresting picture book that goes to the heart of human relationships. This breathtaking story has won acclaim around the world: CBCA Picture Book of the Year; two Premiers’ literary awards; honours in Germany, Brazil, Japan; a shortlisting for the prestigious Kate Greenaway Medal in the UK, and more. Click here to read more about Ron Brooks. Ron Brooks spent his childhood in Mallacoota, Victoria. Now he writes, designs and illustrates picture books for kids. He has made many books over the thirty or so years he has been working, has won many awards, including the Children’s Book Council of Australia Picture Book of the Year Award (three times) and is published in many languages around the world. Two of his earlier books, The Bunyip of Berkeley’s Creek and John Brown, Rose and the Midnight Cat, both written by Jenny Wagner, are widely recognised as the books which introduced Australian picture books onto the world scene. 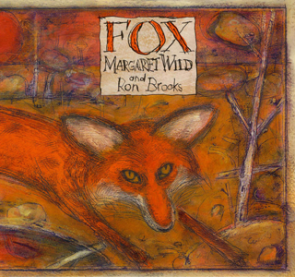 Two of his more recent books, and perhaps his own personal favourites, are Old Pig and Fox, both written by Margaret Wild. He has also been a teacher, and he paints, sculpts, and does a bit of printmaking.